How much is lost when 48 pieces of the 50 scheduled for the day are produced but the remaining 2 are not produced the next day because the scheduling system was not updated? How much more value would be created for the manufacturer's customer if all of the "as-manufactured" data for the product is ported back into the BIM model that they will use to maintain and manage the project after completion? How much could the cost of holding a customer's inventory be reduced if the manufacturer has access to construction schedules in real time? How much could the manufacturer save in inventory costs if its vendors are able to provide materials on a just-in-time basis? As you can see from the graphic above, our strategy is to solve this data silo problem for our customers. We see this as our enhanced version of a Manufacturing Execution System (MES) for infrastructure manufacturers. MES systems... defined as "systems used in manufacturing to track and document the transformation of raw materials to finished goods"... are generating traction in other industries. With $2.7 trillion of global infrastructure spending expected in 2019, the productivity improvement from data collection and centralization in infrastructure manufacturing is likely to exceed most other industries. We call our platform Connected Concrete™. It is centered in data collection through RFID product tracking and is built to integrate with both internal and external systems. If you would like to learn more, please click below to start a dialog. Our mission at Idencia is to elevate the productivity of infrastructure product manufacturers. We offer RFID tracking solutions that improve productivity and offer value throughout the value chain. 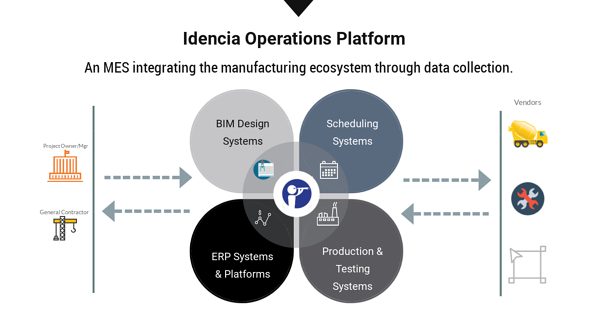 As a cloud-hosted product tracking system that is seamless between manufacturers, contractors and asset managers, Idencia adds information value to all, eliminates redundancy and saves time.